It allows a wireless network to be expanded using multiple access points without for a wired backbone to link them. The Wi-Fi extender connects to your router wirelessly,strengthening and expanding its signal into areas it can't reach on its own. 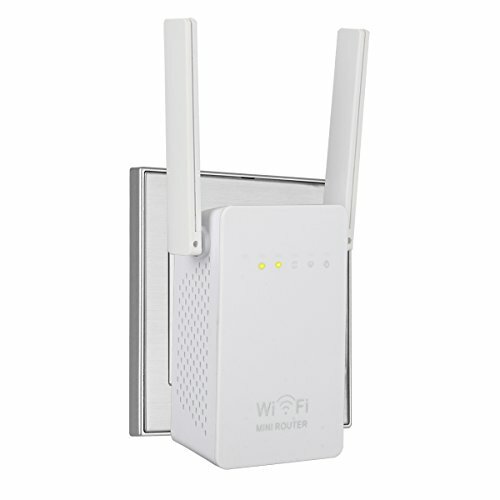 Featuring Long Range Extender Integrated Antenna with MIMO technology,the WIFI Booster boosts speeds and increases eciency throughout network. ●WLAN acess point and the WLAN client with automatic IP address assignment(DHCP). ●Forwarding of IPv4-based protocols/Address Resolution Protocol. ●Complies with IEEE 802.11N/G/B Standards. Then press WPS button on SERMICLE Wifi Extender Repeater for a couple of seconds. When you need to use the extender you log into your system through that with the same password you use for your router. ---Extend Wifi Coverage---Innovative Dual Band Technology,Internal Omni Directional antenna.Boosts your existing Wifi coverage, extend wireless network to hard-to-reach areas. Providing a better wireless performance.Make it possible for you to watch video and play games with your phone or laptop at anywhere in your big house. ----Newest IEEE 802.11N/G/B Standards & 4-In-1 Working Modes ---- Wireless-N speed up to 300Mbps, ideal for video streaming, online gaming and Internet calling.Supports Router/AP/Repeater/WISP Modes. Different modes for different uses. ---Fast & Easy to Setup---Figure out in minutes.No driver DVD needed. Detachable & Convenient wall-plug design,Work with any Wifi router or gateway. ---WPS Button---WPS button makes a easy wireless security encryption to protect your wireless environment by Push Button Configuration. Easy two touch setup,Press the WPS button on your router and the WPS button on your repeater to get set up in seconds.Supports WEP,WPA/WPA2,WPA-PSK/WPA2-PSK encryptions. If you have any questions about this product by Sermicle, contact us by completing and submitting the form below. If you are looking for a specif part number, please include it with your message.